Under Construction – Not Finished Yet! My Speed Density system is based on the Evo8/9 system written by JCSBanks. Big thanks goes to him for coming up with the idea and starting it all. A few improvements and changes have been made in order to port it to the H8 ecus. The most notable improvement is the use of a 3D Volumetric Efficiency map. The original Evo8/9 Speed Density used two 2D maps, one VE vs Boost, and one VE vs RPM. While this is sufficient 99% of the time and makes tuning much simpler, there are some situations where a 3D map is necessary. One example is when maxing a turbo out its compressor map efficiency will rapidly drop, there isn’t an easy way to compensate for this VE change without a 3D map. Another improvement is the ability to log VE. This allows you with the MAF still in place to log VE and make you VE map for Speed Density. 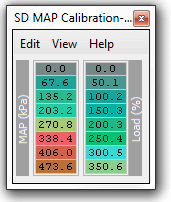 There are two main maps used for Speed Density, SD MAP Calibration and SD Volumetric Efficiency. SD MAP Calibration is the most important table for Speed Density. It is what transforms Boost(MAP) into Load(MAF). The above table is for a 3 BAR setup. kPa should equal Load for every division. 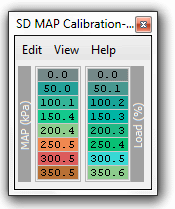 SD Volumetric Efficiency modifies the Load calculated in the SD MAP Calibration table. It increases or decreases the final Load depending on engine RPM and Boost. There are two stages of hardware setup. The first is with your MAF still in place and a MAP sensor connected. This allows you to log VE and build your VE maps. The second is full Speed Density, with a MAP sensor connected, and a IAT sensor connected instead of the MAF. Any 5 volt MAP Sensor can be used, but to make things easier for yourself you should use one of the sensors below that the scaling for has already been added. DSM – The MAP Sensor replaces the stock MDP Sensor. It should be plugged or wired into the MDP connector. +5 volt — Green with Yellow Stripe wire. Signal — Light Green with Black Stripe wire. An IAT sensor replaces the MAF’s stock temp sensor when switching to full Speed Density. DSM – A GM IAT sensor is wired into the MAF connector’s pins 5 and 6. Pin 8 is empty for reference. The DSMs by default are set up for the GM 3 BAR. If you are using a different MAP sensor you must change some setting in EcuFlash. For this example we will be using a Omni 4 BAR. 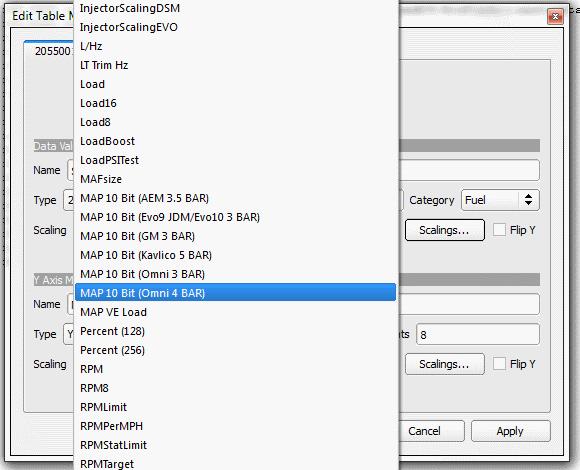 Then click Scaling for the Y Axis, and select MAP 10 Bit (Omni 4 BAR). Now you will notice, since we changed the Scaling the MAP axis is messed up. And since we are now using a 4 BAR sensor we will need to change the Load as well.